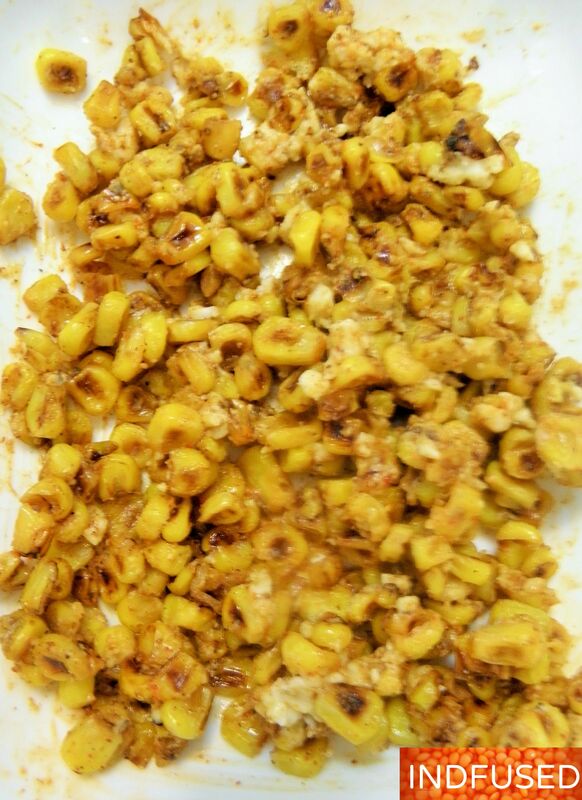 Corn, spices and cheese, ready for the pizza! Then added the green chutney. I used store bought chutney but many a times will use a green chutney that I have previously made and refrigerated. 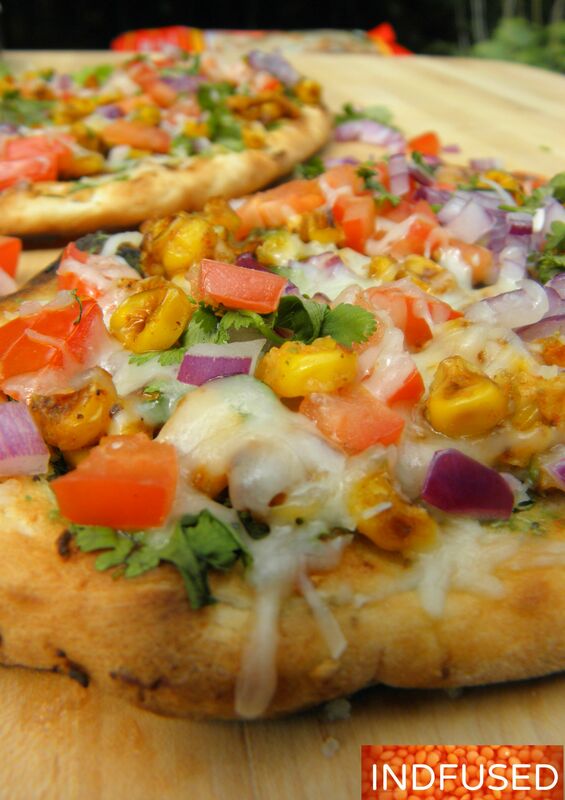 Top with cheese, corn mixture, diced tomatoes, red onion and cilantro leaves. Top with the shredded 5 cheese blend and the toppings! Grill on low, with the lid covered, one to two minutes, until the cheese is all melty and gooey and the tomatoes and onions have that freshly grilled taste that perk up their flavors! 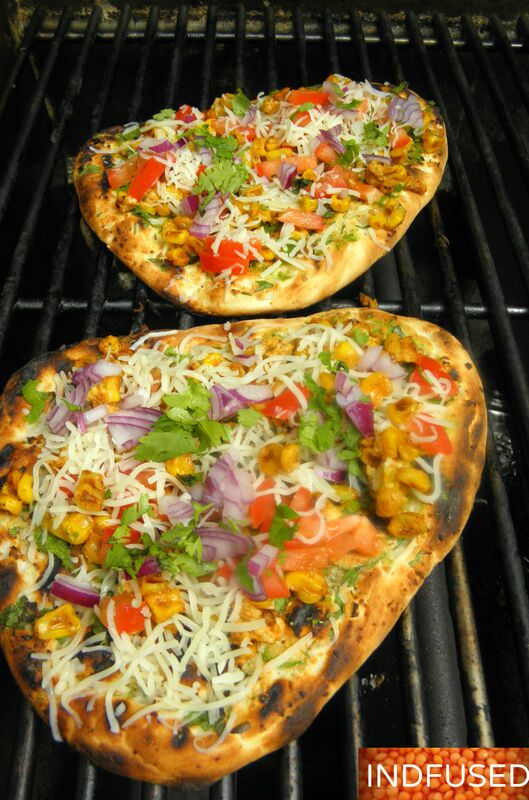 Naan Pizza ready with ooey gooey cheese and veggies with that freshly grilled taste! 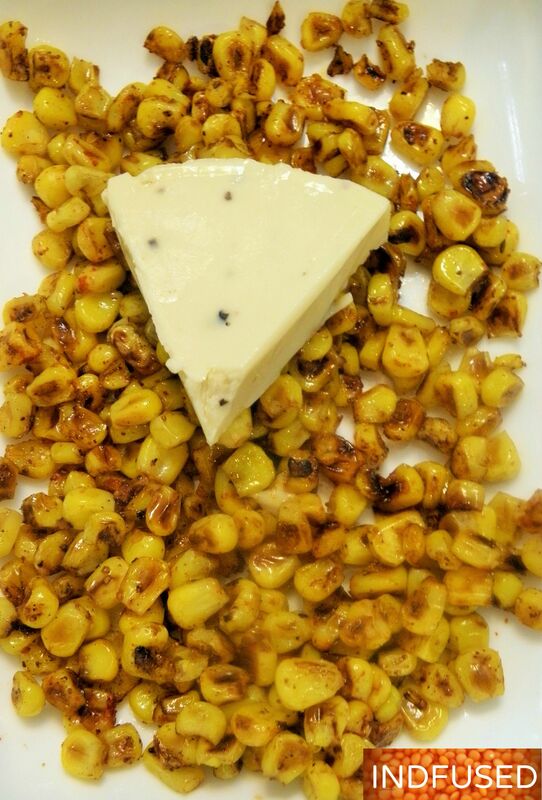 1 cup corn kernels, freshly grilled and removed or frozen corn kernels defrosted and roasted in 1 teaspoon oil. For the corn topping- To the grilled or pan roasted corn kernels, add the cumin seed powder, chili powder, sea salt, brown sugar and lime juice. Stir and mix in the soft wedge of parmesan peppercorn cheese. Set aside. 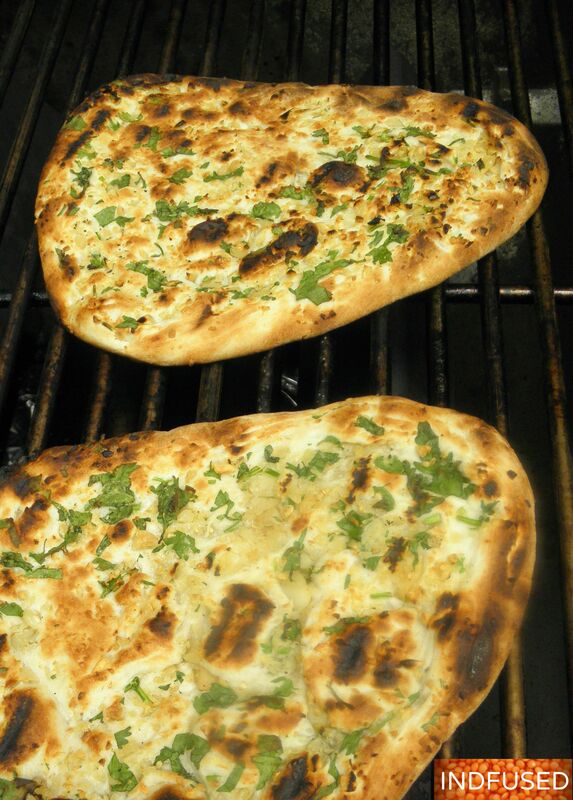 Grill the garlic naan on a preheated grill for about 1 minute on each side. To with a teaspoon each of the green chutney and spread it on the naan. 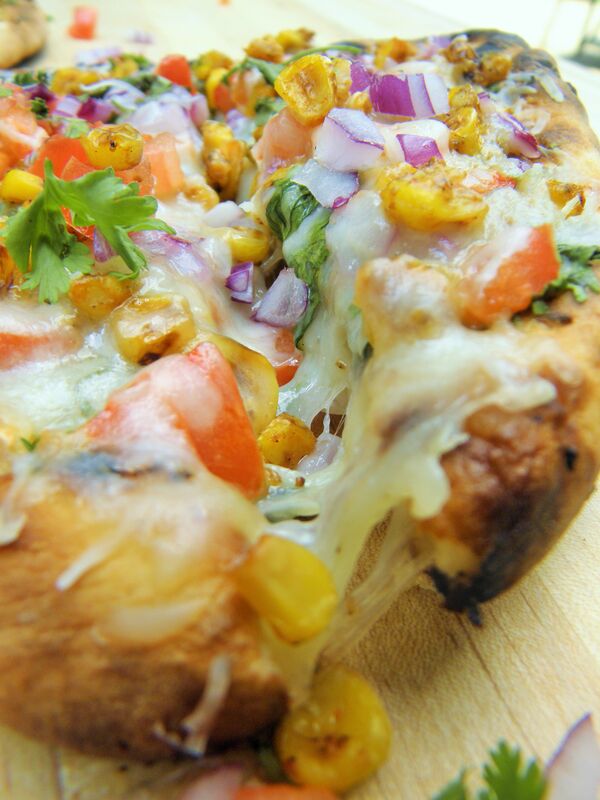 Top with the shredded Italian cheese, corn mixture, diced tomatoes and onions and the chopped cilantro leaves. Grill, covered on low for about a minute or until the cheese melts. Remove from the grill and cut in half. Serve. Quick and easy weeknight meal is ready! Enjoy! Excellent idea to use the nan for the base! Thank you so much! It bake sin one minute and has the perfect texture! Looks good. Will definitely try!! 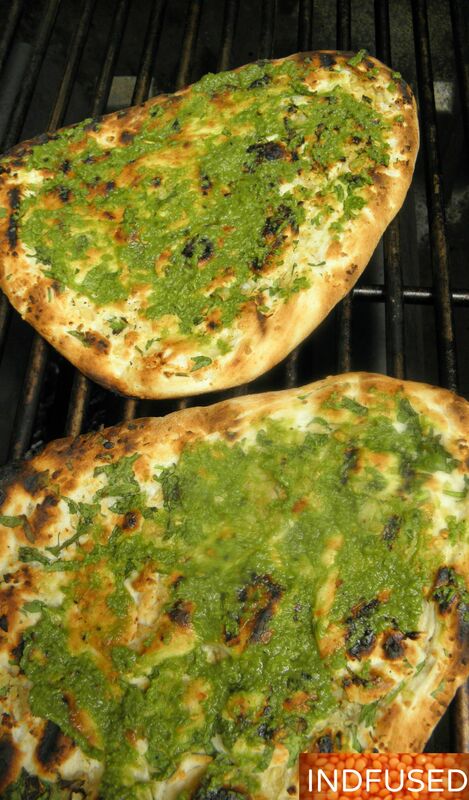 Yumm Sandhya, these grilled naans look awesome – I like the addition of the chutney as a base sauce before you put on all those other goodies. Tell me though, did that naan bread come with all those nice bits of coriander or whatever green is on there (your first picture)? A friend just delivered some nice fresh corn, so perhaps I should make these for a quick supper. Loretta, sorry for the delay in replying. Yes the frozen garlic naan came with bits of garlic and coriander on top. The chutney gives the pizza a nice kick .It is a quick and easy supper for sure! Thanks, as always, for your sweet comments. Thank you Bec! I love the colorful veggies of the summer too! Thanks. So easy to put together too! What pretty pictures and what a great recipe! Smoky, spicy.. absolutely perfect!! Thank you so much Heather! Truly appreciate your kind words. Sandhya, we love Indian Naan bread and Indian food in general. This is a great variation on the traditional pizza that I will be trying. Thanks so much for sharing. Thank you so much! Do let me know how you like it! Thank you Madiha! It is quick and easy to put together, right? Thank you so much Robin! I am so glad you tried the pizza with corn, fresh tomatoes, onions and cumin. Isn’t it cell phones are great, aren’t they? You made my day, Robin! Wow! Warm Thanksgivings are rare in New England, as you know. But this year the weather has been warm so far.Walking around the zoo is so relaxing! Yes this pizza can be put together quickly and tastes awesome when grilled. This year was when my grandson was 3, so 3 years ago. We put turkey in oven, started casseroles and they would be able to re-warm, then since Thanksgiving is Free day st Cleveland Zoo, we went all adults and one child, at the time. Sandhya, we like cornbread stuffing, real cranberries in a sugar and vanilla syrup, green beans sauteed with almonds or onions, mashed potatoes and gravy. What a fun tradition to go to the zoo while the turkey cooks! I am drooling reading about your menu.